One thing that I’ve always wanted to experiment with is building my own guitar style magnetic pickup. The big hurdle to tackle in this kind of project is finding a good way to wind the very thin magnetic wire. Doing it by hand would take many hours and the logistics of using something like a power drill provides a different set of problems. So, I decided to build a simple rig for accomplishing the job. Below is a picture of the winding machine just before I wired in the step motor. All in all, building this cost about $50 or so I already had the wood for the frame sitting around. 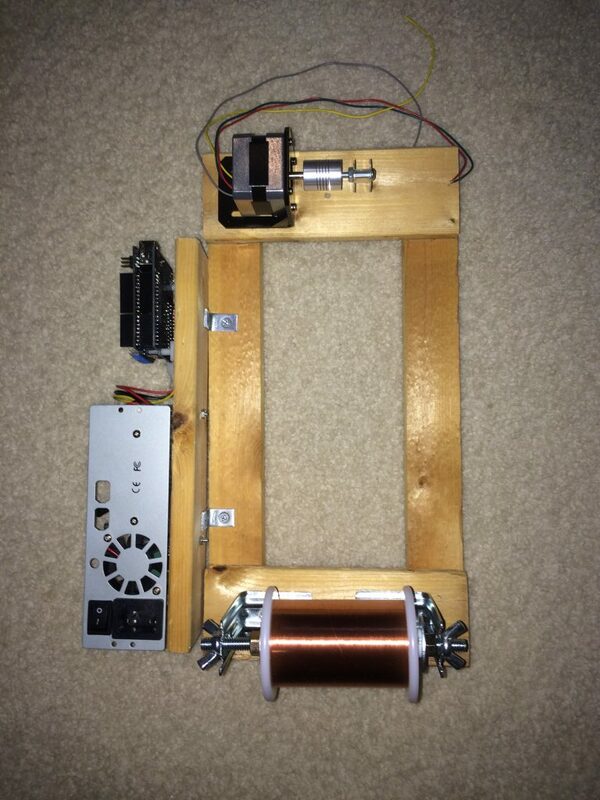 The motor is a Nema 17 stepper motor from Adafruit. The driver board for that runs the motor is also from Adafruit and it sits on top of an Arduino Uno. The power supply was pulled from an old external hard drive that I used to have and it supplies a nice steady 12v to run the whole system. Below is the first test winding that I did. I used a sewing bobbin as the center piece and the magnetic wire is the typical kind that’s used in guitar pickups. This initial winding only measures out at 420 ohms which is quite a bit less than I really needed since a standard guitar pickup has about 1.5k ohms or so depending on the make and model. You can see the finished product at the top of this post. To finish off the pickup, I drilled a few holes into a plastic pill container. One hole at the top for the screw to mount the bobbin, and two holes to thread each end of the magnetic wire. I then soldered the wire on to strips of copper foil tape and stuck them to the side of the container. The bobbin goes inside the container and is mounted to the screw. 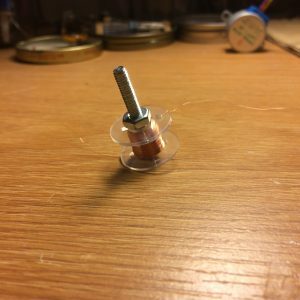 Glued to the end of the screw underneath the bobbin is a strong neodymium magnet to provide the magnetic field. This first test was a smashing success! While it’s a little on the weak side, the pickup works great and I was able to get a nice sound out of various guitar strings. 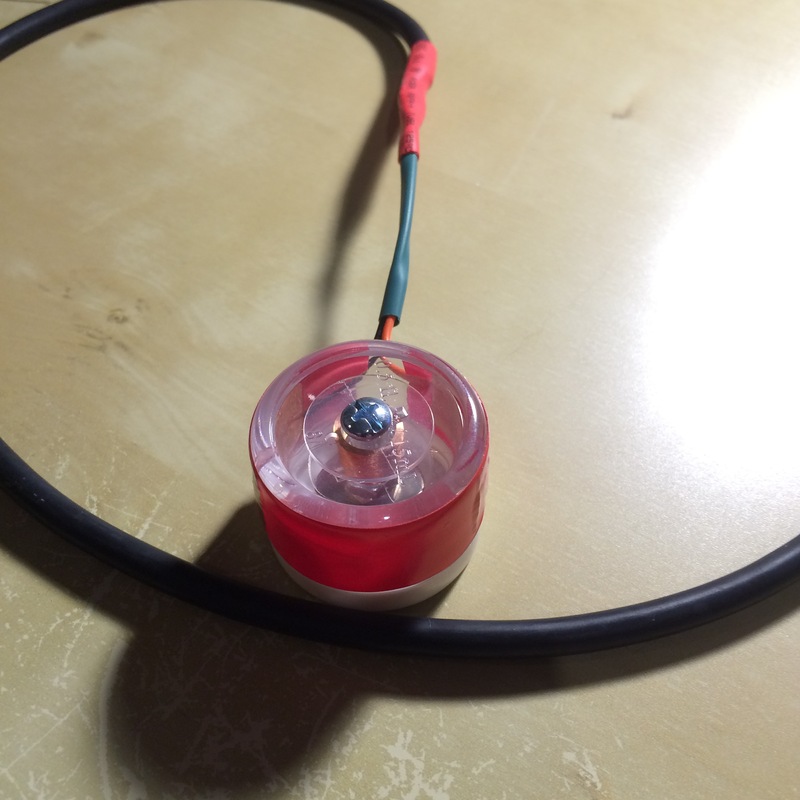 Below is a recording of some experiments that I did after I finished building the first one. I also put together a little video explaining the process of how I put things together.